Mark Richards, Karen Cassidy and Ellie Zint from First State Bank recently made a check presentation to Jon Creamer, athletic director at Washington High School. 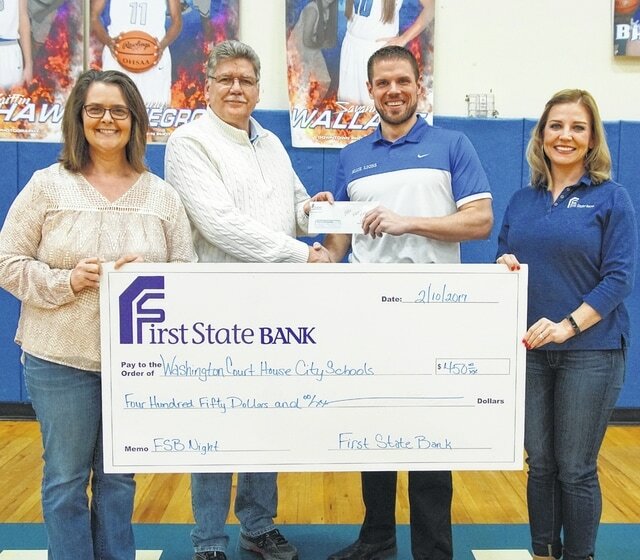 The First State Bank team recently announced the donation of $450 to the Washington Court House City Schools’ athletic program for the winter sports season. The contribution toward the program was made at the Washington Court House Senior Night basketball game on Friday, Feb. 10, against Wilmington High School. The official check presentation was made before the basketball game and the Seniors Night presentation. The check was presented by Mark Richards, Karen Cassidy and Ellie Zint from First State Bank to Jon Creamer, athletic director. First State Bank offers customers a full range of products including traditional, personal, commercial and agricultural loan and deposit solutions. Additionally, First State Bank customers have the option of convenient online and mobile banking. FSB Mobile App users also now have the option of mobile check deposit, so checks can be deposited anywhere, anytime. Dedicated to providing exceptional customer service and high value products while enhancing shareholder value, First State Bank officials say they have been a trusted and respected community institution since 1884. With a loan production office in Clinton County (non-depository office, not insured by the FDIC) and banking center locations in Adams, Brown, Highland, Fayette and Hamilton counties, all banking center operations and management are locally controlled. To learn more about First State Bank, visit www.fsb4me.com. https://www.recordherald.com/wp-content/uploads/sites/27/2017/02/web1_FirstStateBankDonation.jpgMark Richards, Karen Cassidy and Ellie Zint from First State Bank recently made a check presentation to Jon Creamer, athletic director at Washington High School.